Integrated Healthcare Policy Consortium (IHPC) is asking for community input on its next steps. IHPC is the most significant lobbying coalition for integrated healthcare at the federal level. IHPC has posted a 10 question Survey Monkey poll through which they are soliciting input. A multidisciplinary 501c4 lobbying organization, IHPC was instrumental in creating some of the important advances for integrative practice in HR 3590, the Obama-Pelosi healthcare overhaul law. Led by Janet Kahn, PhD, executive director and Len Wisneski, MD, chair, the organization also had a hand in others. One current IHPC action area: lobbying specific members of the integrative practice community onto new federal panels to be created under the law. IHPC's direction is ultimately set by a board that consists of recognized leaders from integrative medicine (MD), acupuncture and Oriental medicine, chiropractic medicine, naturopathic medicine, massage therapy, midwifery and homeopathy. A similar range is evident in the institutions that are IHPC's financial backers. Topics on the IHPC survey include appointments to panels, defending the non-discrimination provision (Section 2706) and the potential in expanding into environmental issues. The 10-question Survey Monkey poll is available here. Comment: As co-founder and now close observer and cheer-leader for IHPC's efforts to attract partners and capital to move its mission, I was pleased to learn recently that the Palmer Center for Chiropractic Health Policy became IHPC's newest member of its Partners for Health program. Direct chiropractic presence among its partners had been missing. In addition, according to Kahn, Palmer's vice-chancellor Christine Goertz, PhD, DC, an Integrator adviser, former NIH NCCAM program officer and savvy policy operator is likely to join IHPC's multi-disciplinary board following an IHPC meeting later this month. Check out the IHPC's Partners for Health program for more information. Consider having your institution or business join. Imagine a robust integrative health force in the Beltway. If not now, when? If not us, who? Update on Section 2706/non-discrimination: AMA moves for repeal, chiropractors say "over our dead bodies"
" ... while we have many relationships with our colleagues in medicine, there are elements in organized, political medicine that would like nothing more than to keep the doctors of chiropractic and nursing and other providers just bottled up and contained ... We've got a battle ahead of us. The long knives are coming out ... I hesitate to say this because it gives me the creeps, but over our dead bodies will this be repealed." The American Holistic Medical Association provided its members a useful compilation of language relative to prevention and health promotion in the Obama-Pelosi healthcare overhaul law in their June 2010 newsletter. The article notes 10 separate places where the Patient Protection and Affordable Healthcare Act touches on the subject of prevention. While there is little here yet that embodies a progressive approach to primary prevention, many are clearly steps in the right direction. With an introductory statement that "yoga finds a 'home' at Bethesda Medical Center," Yoga Therapy Today published a June 2010 cover story on how yoga is being incorporated into the US Navy's emerging medical home movement. A yoga and meditation room is now part of "one of the most innovative patient-centered outpatient clinics in America" at the National Naval Medical Center in Bethesda. The Bethesda center is reportedly the first to bring a yoga teacher as a full-time staff member, according to Ellen-Marie Whelan, a healthcare expert and yoga teacher who works at the progressive think tank Center for American Progress. The writer of the article, Nancy O'Brien, argues that openness for yoga came during the debate over the importance of evidence in the passage of the Health Care and Education Affordability Reconciliation Act which was attached to the Obama healthcare reform legislation. The article underscores how employed practitioners working together in the same facility are incentivized toward better team care. Information on the Naval Center Medical Home is here. Comment: The article is a useful read for any practitioners who seek to find their way into these medical homes. A requirement for integration of diverse practitioners is in-laid in the Obama reform act. (See Section 3502: Establishing Community Health Teams to Support the Patient-Centered Medical Home.) Notably, while the law states that these homes can include "licensed complementary and alternative healthcare practitioners," the law is silent on other "integrative practitioners" such as those yoga teachers and therapists who do not have a license in their field. "Naturopathy and the Primary Care Practice" is the title of a recently published article by Sara Fleming, ND and Nancy Gutknecht, ND. The authors are post-doctoral research fellows associated with the department of family medicine at the University of Wisconsin-Madison. Of most interest may be a chart that lists 15 separate therapies routinely used as part of naturopathic practice. The authors provide an assessment of the strength of research support for each. These range from the use of TENS, to multivitamins, mindfulness, individual homeopathics and botanicals to co-management of patients with medical doctors. The entire document is accessible here. Comment: One value of this article to the naturopathic profession is simply its placement in this journal that focuses on primary care. The profession is working to claim that position in the system. The synopsis notes: "Naturopathy is a distinct type of primary care medicine that blends age-old healing traditions with scientific advances and current research." The Bravewell Collaborative has opened applications for its next round of Fellowships in Integrative Medicine. The program seeks to identify and educate "future leaders in integrative medicine." Bravewell, which began the program in 2003, supports the cost of the $30,000 plus fellowship offered through the University of Arizona Center for Integrative Medicine. This year, according to a source who preferred to remain anonymous, "Bravewell is using a new process with the application starting with Bravewell then looping back to an academic medical center to create the full application, including how the center and prospective fellow will work together, and involve a community medicine component." A key change: "Ultimately the fellows will be chosen at the Bravewell level rather than by the centers." Center leaders have been told that 23 positions will be funded. Bravewell maintains a list on its site of past Fellows from the classes of 2006, 2008 and 2010. Comment: One can gain a sense of the impact of this Bravewell leadership program by examining the bios of the past Fellows on their website. Regarding the new centralization of control of the selection, which will likely mean that some integrative medicine center directors won't get who they want, I'm guessing that if I were dispensing these funds, I might favor this change. Integrative Therapeutics (ITI) and the American Association of Naturopathic Physicians (AANP) have announced the winners of the 2010 ITI-funded residency. The program supports residencies of two recent naturopathic medical graduates who will practice in integrative environments under direction of ND-MD teams. One winner is Corinne Sell, ND, from the National College of Natural Medicine. Sell's residency will be at NatureMed Clinic, LLC in Boulder, Colorado under the guidance of Stephen W. Parcell, ND and Fran Mason, MD. The second for 2010 is Kelly Simms, ND, from the Southwest College of Naturopathic Medicine. She will engage her residency at Integrative Family Wellness Center in Brookfield, Wisconsin under Michele Nickels, ND and Bozena Simon, MD. The program promises those selected "invaluable real-world experience" ranging from patient care to the daily financial workings of the practice." The program, funded by Integrative Therapeutics, accredited by the Council on Naturopathic Medical Education and monitored as a residency through Bastyr University, is recruiting applicants for 2011. Qualified sites must be a successful integrative medical practice with both an ND and MD on staff or a situation with an ND who practices in partnership with an MD within a 30 mile radius. The funding firm, Integrative Therapeutics, is a supplement company that was formed through venture capital-backed purchase of a handful of natural products firms that were founded or guided by naturopathic physicians. The multidisciplinary National University of Health Sciences announced on June 9, 2010 that Standard Process has pledged $500,000 "for significant upgrades to its campus facilities." Over half will upgrade the NUHS biochemistry lab. Says Tracy McHugh, NUHS' vice president: "A new biochemistry lab, being the primary wet lab for our basic science instruction, has been a top priority for the university for some time." The release noted that Standard Process has supported the university in other ways, including "several pallets of supplements" to support NUHS' clinics through which their students and faculty provide care for the homeless. Alliance for Massage Therapy Education calls founding conference "a great success"
The Alliance for Massage Therapy Education (AfMTE), a new organization that seeks to be "the voice, advocate and resource for the community of massage therapy schools and educators" completed its founding conference in June 2010, declaringteh conference a success. The 85 participants assisted in AfMTE's organization-building work by electing the first Board of Directors and a nominating committee for the succeeding year's election. AfMTE's board president is Pete Whitridge, LMT, the director of education for the Florida School of Massage. The executive director and lead organizer is Rick Rosen, LMT, co-director of the Body Therapy Institute in Siler City, North Carolina. In a release on the conference, Rosen states: "Though we have only been serving this important community for a matter of months, the attendees were focused on how the Alliance will serve as a robust, results focused collaborator with its members and other important stakeholder organizations." Comment: I asked Integrator adviser and attendee Jan Schwartz, MA, for her perspective. Schwartz is a past-president of the Commission on Massage Therapy Accreditation and co-founder of Education Training Solutions. She sent me this very positive note: "The meeting was a gathering of educators and school owners who all want to move the profession of massage therapy forward. As educators, we had an opportunity to envision together some of the specific directions that would be needed to make this goal a reality, and that was followed by individual commitments to help make changes where changes are needed. Two items that resonated for me were teacher training and helping students and practitioners become more research literate--a first step toward evidence informed practices." The Academic Consortium for Complementary and Alternative Health Care (ACCAHC) reported the formation of a new Council of Advisers in its July 2010 Quarterly Report. The organization of 17 national organizations related to education for the complementary healthcare disciplines has a priority on disseminating and creating approaches, strategies, products and policies that will support appropriate integration. While the organization's own board consists of leaders from these organizations, ACCAHC created the Council of Advisers to provide "exceptional advice from leaders from outside our disciplines." The initial group includes includes Richard Cooper, MD, DSc, Aviad Haramati, PhD, Wayne Jonas, MD, Ben Kligler, MD, MPH, Lori Knutson, RN, BC-HN, Mary Jo Kreitzer, RN, PhD, Anne Nedrow, MD and Adam Perlman, MD, MPH. Links to each of their bios are here. Alignment of interest note: I serve in the leadership of ACCAHC. The July 2, 2010 NCCAM Update from the NIH National Center for Complementary and Alternative Medicine announced publication of a brief fact sheet entitled Credentialing CAM Providers: Understanding CAM Education, Training, Regulation, and Licensing. The fact sheet provides information on licensing, credentialing and the regulatory status of the distinctly licensed CAM fields listed as chiropractic, acupuncture, homeopathy, massage therapy and naturopathy. Other fields are referenced. The information is updated by NCCAM staff from published work completed by Michael Cohen, JD, David Eisenberg, MD, Anne Nedrow, MD and others. Comment: Self-interest here in noting that it would have been a public service had they chosen to reference ACCAHC's Clinicians and Educators Desk Reference on the Complementary and Alternative Healthcare Professions among the additional resources. Ahh, the missed chances from not being the boss of the universe. The May/June 2010 issue of Explore includes an informative review entitled American Board of Integrative and Holistic Medicine (ABIHM): Past, President and Future in which Victor Sierpina, MD interviews leaders of the MD/DO certification organization. Originally incorporated as the American Board of Holistic Medicine by Robert Anderson, MD and others in 1996, the ABIHM added "integrative" to its title in 2008. Current president Patrick Hanaway, MD explains: "We see the role of ABIHM as providing a link between the committed humanism and relationship-oriented healthcare of holism and the growing evidence base and academic recognition of integrative medicine." ABIHM President-elect Scott Shannon, MD shares 3 areas where he expects some changes at ABIHM: more work with residencies and fellowships on standardized expectations of curriculum; limiting potential for conflicts of interest by separating functions of the ABIHM Board from those of ABIHM's testing committee; and exploration of how to best integrate ecological medicine with integrative and holistic practice. Shannon describes "ecological medicine" as "understanding the whole person in all the eco-systems in which they exist" including social, political and economic dimensions. As of January 1, 2010, roughly 1300 MDs and DOs had gained certification through ABIHM or its predecessor. Comment: This is fine work, in all 3 domains: standard setting in integrative-holistic education; internal housekeeping for ABIHM as a quality certification organization; and clarification and expansion of philosophical and content base. The integrative-holistic medicine field can benefit from clearer definition and standards. Notably, the article on NCCAM's information sheet for the public on credentialing CAM providers, reported in this Round-up, doesn't give the public any guidance on credentialing an "integrative-holistic medical doctor." It would be interesting to see the results if NCCAM tackled the development of a "credentialing integrative-holistic medical doctors" fact sheet. Credit ABIHM for stepping into the void. AMA officially supports "personalized medicine"
"It has long been known that individual patients respond to the same disease and treatments differently, and the goal of PM is to identify these individual differences so that the best treatments and preventions can be used. In order to maximize the benefit of PM, the health care workforce needs ongoing education about the use of genetic technologies in clinical care. Adequate oversight and regulation must be implemented, and coverage of clinically useful PM should be considered by insurers." Comment: Over the last 3 decades, holistic and environmental and naturopathic doctors have argued their distinctiveness from conventional practice in part via responsive to "biochemical individuality" and their provision of "individualized care." This was in opposition to cook-book, reductive, pharma-based protocols that have dominated conventional treatment. Thus, this AMA endorsement seemed notable. Of course, it is also worth adding that it wasn't the individuality of patients as much as the backing of the genetic testing industry that, at this moment in time, brought this endorsement of common sense. "Current discussions among practitioners, legislators, and regulators in the U.S. and Canada are laying the foundation for the future of homeopathic medicine. There is a need for homeopaths to come together with a unified voice to define the profession." So begins the May 25, 2010 letter from Heidi Schor, president of the Council on Homeopathic Education (CHE) and Karen Allen, president of the Council for Homeopathic Certification. The letter went out to leaders of other homeopathic organizations to invite them to a meeting to be held this fall. Schor and Allen continue: "Agreed upon standards and competencies speak to a stable, cohesive, and vital profession and will serve as a guideline as homeopathy becomes regulated and integrated into mainstream medicine." The purpose will be to review the current Standards and Competencies for Professional Practice of Homeopathy in North America that was drafted in 2000 at a similar gathering. The goal is to make sure that the standards "remain consistent with the current state of homeopathy in the US and Canada, and the goals of the profession." Comment: Schor, Allen and Nancy Gahles, DC, CCH, RS HOM (NA) are proving a powerful trio of homeopathic leaders in their determined efforts to move that field into more significant participation in US health care. Schor has taken on the challenge of staging CHE to seek recognition as an accrediting agency from the US Department of Education. Allen is moving the certification organization on a parallel path, toward recognition by the Institute for Credentialing Excellent (formerly the National Organization for Competency Assurance). Gahles, the president of the National Center for Homeopathy, has introduced homeopathy into policy dialogues through membership in the Integrated Healthcare Policy Consortium and into the research policy debate through input on the NCCAM strategic plan and a high level meeting with NCCAM leadership. Under their combined direction, this polymorphous 200 year-old field, which ranges from lay practitioners to licensed MD-homeopaths, is marked by multiple forms of recognition or health freedom statutes in various states and has a surprising, 4-decade-old federal recognition of its products, is increasingly showing up. Hindawi Publishing Corporation, owner of over 200 open access journals, is the new publisher of Evidence Based Complementary and Alternative Medicine or E-CAM. Oxford Journals, the former publisher, continues to have a website with no mention of the transition, however. The change in ownership took place January 1, 2010. The editorial advisory team is international. Comment: An examination of the Hindawi site finds that, while the firm has affiliation with some organizations linked to the content areas of its other journals, the firm does not at this time have such association memberships or media exchange relationships in the CAM space. A publication that says it has the largest readership among "physicians who specialize in natural medicine," Naturopathic Physicians News and Reviews, is celebrating completion of its 5th year. With a total circulation of 10,000, the readership core for this monthly is licensed naturopathic physicians, a field that counts less than 5,000 in North America. In a statement on their 5th birthday, the publishers report a 67% increase in unique website visitors and a 55% increase in total website visitors in the first 5 months in 2010. 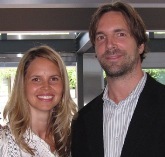 NDNR's co-founders are David Tallman, DC, ND and natural health activist Razi Berry-Tallman. The team also publishes the peer-reviewed International Journal of Natural Medicine. Comment: Tallman and Berry-Tallman have managed to gain a significant, respected foothold in the naturopathic profession, drawing many respected clinicians and educators to produce the articles that fill its pages. Their marketing of NDNR as "an opportunity for grand rounds with a naturopathic physician" is apt. One touch I particularly like is the subheading of sections of the monthly based on the Latin names of core naturopathic principles: tolle causam, docere, primum no nocere, etc. Information Television Network (ITV), a production company known for award-winning shows that have aired on networks such as PBS, Discovery Channel and NBC is working on a new series that will be dedicated to integrative therapies. The South Florida-based firm is creating DVDs as an educational documentary series, according to a letter made available to the Integrator. The first was dedicated to tai chi, the second to meditation, and now the third program in the series is "dedicated to taking a definitive look into acupuncture through the lens of science." The DVDs will help "patients and health care professionals to learn the benefits of including these therapies in their medical practices." Phyllis Man is the producer on the project. The international homeopathic society, Liga Medicorum Homeopathica Internationalis (LMHI), held its 65th annual meeting and the first in the U.S. since 1997, in Redondo Beach, CA, May 18-22. Joyce Frye DO,MBA,MSCE,FACOG, ABIHM, an assistant professor at the Center for Integrative Medicine at the University of Maryland School of Medicine filed this report. "Despite overlapping meetings with the Institute for Functional Medicine down the road in Carlsbad and with the International Congress on Complementary Medicine Research in Norway, 430 attendees from 40 countries with over 100 speakers gathered to celebrate the 200 year anniversary of Hahnemann's first edition of the THE ORGANON of MEDICINE under the Congress' theme, 2010: A Homeopathic Odyssey. "The scientific program kicked off with a keynote from Dr. Martin Chaplin, BSc, PhD, CChem, FRSC, Emeritus Professor of Applied Science at London Southbank University. With special expertise in aqueous systems, especially intracellular water, he described the unique properties of water that make it possible that, yes, water does have memory. (See more on his website). "The concluding keynote was delivered by Dr. Wayne Jonas who described his introduction to homeopathy during a medical school preceptorship and initial training at the side of the late Dr. Jost Kunzli while a military physician in Germany. Using examples from his own experience in homeopathic patient care, Jonas finished with a discussion of the ongoing research challenges for homeopathy. "Sandwiched between the keynotes were 3 ½ days in four lecture halls, including one for the parallel meeting of the Academy of Veterinary Homeopathy, that were packed with lectures on philosophy, materia medica, and methods of prescribing in ADHD, autism, cancer, and auto-immune as well as other diseases; in vitro studies on subjects such as Multi-Drug Resistant Tuberculosis and hepatitis C; and dramatic case reports on congenital heart disease, traumatic brain injury, avascular necrosis of the hip, and Stage IVB cervical cancer. "Dr. Ian Coulter, Samueli Chair in Integrative Medicine and Senior Health Policy Scientist, RAND Corporation spoke about the potential role for comparative effectiveness research in homeopathy and described the process used by the chiropractic profession three decades ago as an example of creating a research culture beginning at the level of the professional schools. "Dr. Richard Hiltner, U.S. Vice President to Liga chaired the Organizing committee, which included, Dr. Todd Hoover, president of the hosting American Institute of Homeopathy; Dr. Richard Moskowitz of the AIH board; and Dr. Joyce Frye from the University of Maryland Center for Integrative Medicine, who served as Scientific Chair. The next LMHI Congress will be held December, 2011 in New Delhi, India. See http://liga.iwmh.net for updated information." The resource that is the "Permanent Committee of Consensus and Coordination for Non Conventional Medicines in Italy"
Paolo Roberti de Sarsina, MD, a co-organizer and founder of the organization named in this title, recently sent notice of its new website. While of greatest use to those who can read Italian, the site of the Comitato Permanente di Consenso e Coordinamento per le Medicine Non Convenzionali in Italia also includes excellent links that are posted in English to key documents and papers on policy from many other countries and multinational entities. For those who have been around these fields for some time, there may be a moment of pleasure in merely scanning across the globe through the myriad publications and report that the Comitato has linked on this site. You may also find one or more of these links useful. On August 13-14, Yongey Mingyur Rinpoche, a Tibetan Buddhist meditation master, and leadership expert and integrative medicine philanthropist Bill George will offer an interactive seminar on leadership at the University of Minnesota's St. Paul campus. George, the former Medtronic CEO and chair, is married to Penny George, the co-founder and first president of the Bravewell Collaborative of philanthropists for integrative medicine. Bill George is now dedicated to writing and speaking on leadership. (An Integrator review of his book True North, which includes integrative concepts, is posted here.) The two plan to explore the integration of the principles of Buddhist mindfulness meditation with the approach George advocates in this True North brand of leadership training. A release notes that "this seminar represents a bold new paradigm in which meditation training is combined with leadership principles to develop mindful leaders dedicated to creating a more peaceful and harmonious world." More information about the seminar is here. Comment: I was sorry to discover that I had a conflict on these dates as this looks a remarkable opportunity to explore ideas about leadership that are grounded in meditative and integrative practices. This could be quite a remarkable opportunity. Integrative pediatrics leader Larry Rosen, MD shares that the Collaborative on Health and the Environment/Commonweal will be co-hosting, with the UCSF Osher Center and Rosen's Whole Child Center, an unusual one-day conference in San Francisco October 1, 2010. The conference "embraces a holistic, whole-child approach, specifically examining the context - the ecology - in which optimal health and wellness is promoted." The range of interacting factors that influence children that will be under examination will include nutrition, education, socio-economic status, exposures to toxic chemicals, and access to preventive health care. The sterling, mixed list of speakers includes Philip Lee, MD, Margaret Chesney, PhD, Fritjof Capra, PhD, and Richard Louv, author of Last Child in the Woods. Rosen anticipates 200 attendees. Comment: The theme is especially notable in light of the coming embrace of ecological medicine anticipated by Scott Shannon, MD for the American Board of Integrative and Holistic Medicine (noted elsewhere in this Round-up). In my exchange with Rosen on this conference, he shared that he is to soon take over as chair of the American Academy of Pediatrics Section on Integrative Medicine. Rosen says he is "working on building broad coalitions to support children's health." He described his perspectives in Integrative Pediatrics: The Future is Now in the September-October 2009 issue of Alternative Therapies in Health and Medicine. 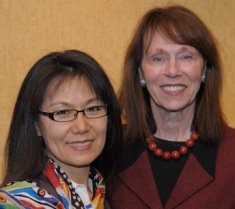 Fellow Sunny Alperson with NINR Director Patricia A. Grady. A colleague shares that the Bravewell Collaborative has extended the deadline on a post doctoral nursing fellowship at the National Institute of Nursing Research at the NIH that it is co-sponsoring. The fellowship is a two year program to encourage interdisciplinary collaboration for a nurse who has a strong interest in integrative medicine and integrative and holistic health. According to the NINR announcement, fellows "will attend the University of Arizona's Program in Integrative Medicine, as well as participate in special interest conferences with clinicians and researchers. (See recent Integrator article on the Fellowship.) One position has been filled and the application period was recently extended to September 15 to find another qualified nurse. There is a November 1st start date at NINR/NIH. Information is available here. Comment: This looks like a great opportunity for the right person. Please share this news with anyone who might be interested. Given the benefits of participation, I am surprised that nurse researchers haven't yet stepped up. Kudos to the Bravewell for moving beyond the MD/DO-only boundaries of the organization's usual giving. The Natural Products Foundation (NPF) announced on June 3, 2010 that Deborah Knowles, MBA has been named executive director of the organization. Knowles was most recently the director of development at the Natural Products Foundation, after joining NPF when the Dietary Supplement Education Alliance (DSEA) became part of NPF. Knowles is a health industry veteran. Later that month, in a June 17, 2010 release, NPF announced the election of Derek Hall as chairman of the organization's board. Hall is a long-time industry leader who has run Nature's Way, Botanicals International, Integrative Therapeutics, Unigen USA and Univera and was a vice-Chairman and CEO of ECONET, Inc. The foundation, closely allied to the Natural Products Association, states that its mission "is to enhance and promote the integrity of natural products through quality, science and education." At the 51st meeting of the American Society of Pharmacognosy (ASP), Mark Blumenthal, founder and executive director of the nonprofit American Botanical Council (ABC), will receive the Varro E. Tyler Prize. According to the Varro E. Tyler Prize Committee, this award was given to Blumenthal "because of his long, dedicated service to the botanical supplement/phytomedicine community, effective leadership of ABC, and his commitment to the development and dissemination of accurate information about the safety and benefits of botanicals." ASP is dedicated to the promotion, growth, and development of pharmacognosy and all aspects of science related to natural products. Tyler, the former dean of the College of Pharmacy and Pharmaceutical Sciences and vice-president of Academic Affairs at Purdue University was a mentor of Blumenthal who served for many years on ABC's Board of Trustees. Blumenthal has been in the herb field for over 35 year, the last 23 growing and directing ABC. Comment: Blumenthal was a mentor to me when, in 1985, on behalf of a little place then called John Bastyr College, I sought to understand how to separate the wheat from the chaff (read "quality components from sweepings") in products of the various suppliers at natural products trade shows. It is pleasing to see Blumenthal's education of tens of thousands honored by ASP and particularly to see this award, given how deeply he cherishes the relationship he had with Tyler. At their June 2010 meeting, the American Holistic Nurses Association (AHNA) honored Jean Watson RN, PhD, FAAN, AHN-BC as the Holistic Nurse of the Year. Watson is dean of nursing at the University of Colorado, she where she established her Center for Human Caring. Earlier in her career, Watson developed the Theory of Transpersonal Caring. In 2007, she founded the international, nonprofit Watson Caring Science Institute. More recently, Watson created the Million Nurse Global Caring Field Project with "the intention to connect a million nurses (or more) around the globe to create a field of worldwide energetic caring consciousness for global healing and health for all." The list of all AHNA's awardees since 1983 is here.